Now that we have described the Bible, studied how to create an outline, understood the literary styles, and discussed reasons for studying the Bible, it's time to begin a discussion on how to study the Bible. In this lesson we'll quickly take a look at the tools you need in order to gain the greatest benefit from your study. There's a riddle that goes: "How do you eat an elephant?" Answer: "One bite at a time." Many people find it difficult just to read through the Bible cover-to-cover one time; so to them, the thought of studying the Bible may seem like an impossible task. There is so much material to cover and some of it is really difficult to understand. But, as with any other large task, such as eating an elephant, if you know how to do it and divide it into smaller parts, you will accomplish a great deal. The best way to grow spiritually is to study the Bible itself. While the studies and teachings of other people can be quite helpful, you cannot rely on those for your spiritual growth. The study of God's Word is an individual task, perhaps the most personal task you will ever do. It will affect your whole being  who you are, what you do, how you feel. To those of us living the West, this may seem like a ludicrous or ironic point, as it's common for many people in America and Western Europe to have more than one Bible. However, that is not the case for many people in third-world and developing countries or in countries where Christians are persecuted. 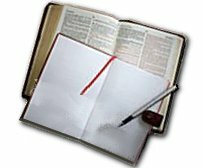 If you have a computer in your home, you can download several different versions of the Bible free of charge for your computer at www.e-sword.net/ or www.theword.exe. For devotional study, you may have one favorite Bible translation that you prefer and use consistently. However, for in-depth studies, it is helpful to have more than one version of the Bible so you can compare the wording of difficult passages of Scripture. The Bible expresses all of God's revelation to man. It tells you all you need to know about your life in Christ and your eternal life in heaven. Thus, the Bible is its own best interpreter. The more you study it, the more you understand its meaning. This also may seem ludicrous, even ridiculous, to mention. But I mention it here to remind you that Bible study requires your full undivided attention. This is not something you do casually around the dinner table or while you're watching TV. In the Bible, physical sight is closely connected to spiritual sight. In fact, the Scriptures often use the word "seeing" to mean "knowing spiritual truth". According to 2 Corinthians 4:4 those who don't believe the Gospel about Christ are blinded by Satan so they cannot see the light that comes from God's Word. (see also Matthew 13:14-16) And Isaiah 44:18 says that those who reject God "close their eyes and their minds to the truth." On the other hand, the pure in heart, those who love God, will "see God" as Matthew 5:8 tells us. Yet, many Christians do not really study God's Word as they should, and therefore, do not "see" or experience as much of God's truth as He wants us to have. The goal of our Bible study is to have greater spiritual insight which will result in a more intimate relationship with our loving God. We want to know God's truth and apply it to our life in our daily decisions and actions (see 1 Corinthians 2:13-16). Through careful study, we will be better prepared to recognize and reject false teachings. There is a direct correlation between writing something and remembering it because you "see" it in a different way. As you actually write repeated words or special things that are mentioned, you will "see" more of what the writer intended. You should write references to other passages so you can read and compare them. Also write any questions that come to your mind as you read, or any thoughts you have. Later when you read over your notes, you will begin to understand the Bible better and you can answer some of your own questions. A Bible Concordance is similar to a book's index. It lists in alphabetical order all the words of the Bible and their Scripture references. For example, if you wanted to read several Scriptures about "faith", you could easily find them by looking up the word "faith" in the Concordance. Many Bibles have a small concordance in the back of them, or you can use the online Concordances and Lexicons we have provided for free at Online Concordances. Dictionaries provide definitions of difficult words and information about biblical times, places, culture, and people. If you don't have a Bible dictionary, we have provided links to several online Dictionaries. These are books written by various Bible scholars who share their own understanding of the Scriptures based on their long and intense studies. We have links to several online Bible Commentaries here. There are many other excellent Bible resources under the "ABTI" tab on AOCI's main site. Above all, ask the Holy Spirit for divine guidance as you put into practice the study methods you learn in these lessons. If this is your first time of actually trying to study the Bible, you should begin with a short book (such as Colossians, which we will study together later). Although you may be able to read more, you really should plan to study only about 20-25 verses a day. Your study will take considerably more time than the reading will. You should cover a short passage [segment] each day in order to gain the most out of your study. Just as you may have questions about how to study, you may have questions about the meaning of certain passages of Scripture. How can you interpret or explain the meaning of them? One rule of interpretation is: Ask questions about each passage of Scripture. Use the following list as a guide, but you should develop your own questions also. What is his main purpose? To whom is he writing? Who or what is the passage about? What was/is the purpose in saying this? What truth does it suggest? We will use Romans 8:26-27 as a sample passage to interpret: "Likewise the Spirit helps us in our weakness. For we do not know what to pray for as we ought, but the Spirit himself intercedes for us with groanings too deep for words. And he who searches hearts knows what is the mind of the Spirit, because the Spirit intercedes for the saints according to the will of God." Who is the author? Not revealed in this passage. What is his main purpose? Not revealed in this passage. To whom is he writing? Not revealed in this passage. Who or what is the passage about? Prayer, specifically the Holy Spirit's prayers on our behalf. How was/is it done? With "groanings too deep for words". These come from deep inside us in "our hearts" where the Spirit dwells. When did/will it happen? The Spirit prays whenever we don't know how or what to pray. Where did/will it happen? The Spirit prays on behalf of God's people wherever they are. What does this passage mean? It means we have a very great Helper who not only pleads with God for us but pleads for that which is according to God's will. What was/is the purpose in saying this? We cannot see yet how these verses serve Paul's main purpose, but they do serve to encourage us in our faith. What truth does it suggest? The verses also suggest that, as we really seek to do God's will, the Holy Spirit will renew our minds. Then we will pray in accordance with God's will. In order to answer the other questions, we must read the verses preceding and following this passage. These verses are referred to as the "context". By reading verses 1-25, we see that the author is discussing our new life in the Spirit (vs. 5, 9) as children of God (vs. 14, 17) who have hope in a future glory (v. 18). This context helps us to understand the author's purpose, why we have the power of the Holy Spirit in our prayers. It is because of who we are in Christ. Next, we can go back to the first chapter to learn that the author was the Apostle Paul, and he was writing to the believers in Rome. After giving his greetings, he states his main purpose of the entire book of Romans in verses 16 and 17: the gospel of Jesus Christ teaches that salvation is by faith, not by anything else. Now we can see how the emphasis in Romans 8:26-27 on our victory through the Holy Spirit supports Paul's main purpose. He teaches that faith brings salvation and future glory in heaven. So, we see that the second rule of interpretation is: Explain the meaning of a Scripture as it relates to its context. False teachings can arise from taking a verse or part of a verse out of its context. Sometimes people claim God's promises while ignoring the conditions that go with them (see the condition in Matthew 6:33). Others may use a verse to support their own belief without paying attention to the intended meaning of the verse, which is based on its context. For example, a man who wants to divorce his wife might refer to 1 Corinthians 7:1 ("Now concerning the matters about which you wrote: "It is good for a man not to have sexual relations with a woman.") to support his desire. But this verse alone is not support enough for his argument. In fact, when we read all of chapter 7 as well as Ephesians 5 and 1 Timothy 4:1-4, we see that divorce is not acceptable to God. When a passage presents limited teaching or a seeming conflict, we need to study other passages that give related teaching. This third rule of interpretation provides a more complete and balanced teaching of the truth. Perhaps the margins of your Bible may list related Scriptures. If not, check your Concordance for Scriptures related to a key word in the passage you're trying to understand. These three rules become easier to use the more you employ them in your study of God's Word. Before you begin any task, it's important to pray for God's wisdom and guidance. This is especially true when you begin to study God's Word. Don't ignore or overlook the relationship between prayer and your study of His Word. Prayer verbalizes our humility, sincerity, and dependence on God. Prayer helps us remember our need for help and guidance. Prayer helps us pay attention to our study and respond to Bible lessons. Prayer opens our minds to receive truth. This passage explains why we must study God's Word. Pray that the Holy Spirit will help you learn as much as you can about interpreting God's Word.